Please be sure to identify any allergies of the participating youth. Adult must accompany child, fee covers both for both. Call the store if you wish to register a second child ($10). Deviled eggs are all the rage in restaurants these days with all sorts of divine flavors and textures. Starting with how to prepare perfect hard-cooked eggs, we'll show you several ways to transform into delicious appetizers--just in time for Easter or any season. Demonstration class; tastings and recipes included. Taco Tuesday will never be the same again! Enjoy a buffet if your creations along with a chef-prepared salad. Incredible edibles are a way to enjoy your recreational or medicinal ingestion of marijuana. Attention: We WILL NOT use any marijuana in class but techniques and recipes will include best practices to incorporate it in the foods you make at home. Neither are we advocating a lifestyle or medical usage. Please do not bring any marijuana onto the premises. Please do not come to class under the influence of any drug or alcohol. This is a 2-hour hands-on class and you'll get a chance to taste your goodies and take home recipes. Lunch & Learn classes are demonstration style where you get a front-row seat as the chef prepares your meal, giving you an opportunity to ask questions and see exactly how to prepare each dish. We're bringing the Parisian street cafe to Pleasanton tonight so you can learn the art of French crepe-making. You'll learn how to make then sit down to enjoy sweet and savory crepes--Spinach, Artichoke & Brie, Ham and Hollandaise Sauce, and the famous Crepes Suzette. * lemon-basil cupcakes with citrus buttercream frosting. Enjoy the flavors of spring in this hands-on class featuring tons of tips and techniques, a full meal, and take-home recipes. Bring some wine if you'd like to enjoy a glass during dinner. Please wear closed toe shoes. If you'd like a vegetarian substitution for the chicken entree, please call the store at least 48 hours in advance of the class. Are you intrigued by hot air frying--creating beautifully crisp food with virtually no fat? Not all hot air fryers are the same. Let us introduce you to Caso by Frieling hot air fryers. In this quick 75-minute demonstration class, we'lll show you the features of hot air fryers and answer your questions. Then we'll make a couple of delish dishes--bacon wrapped asparagus with balsamic vinegar and puff pastry brie bites. Our flash classes are normally $29. This class is a steal at $10, AND you can apply your class fee toward the purchase of a new air fryer if you think one would be well used and well loved in your kitchen. Cooking is far easier if you learn or bone up on how to select, use and maintain the most important tool in your kitchen--the knife! No matter how ugly, old or dull, we recommend you bring your own chef's and paring knives to the class to see how well they can perform for you. We offer fee-for-service knife sharpening once a month, usually on the 4th Thursday. Please consult our class calendar for the next visit from Perfect Edge. This class is a pre-requisite for Culinary Assistant. If you would like to find out about our Culinary Assistant program, information will be provided at the end of the class or you can contact the store anytime for information. Sometimes you just have to indulge in comfort food. It's nurturing and decadent -- it lifts our spirits, soothes us when we're a little blue, and helps us celebrate happy times. Tonight, start with a yummy spinach and artichoke dip all warm and bubbly from the oven with homemade pita chips. Then what's better than mom's home-style pot roast (done in a pressure cooker to save oodles of time but with no sacrifice of flavor)? Bake up a batch of lighter-than-air cheesy biscuits and serve them up with a delish salad dressed with a honey-shallot vinaigrette and finish off your meal with tender coconut cupcakes with creamy buttercream frosting. Please register for two seats. Delightfully light and airy, macarons take a little extra time for the best result. Learn how to make colorful macarons with a variety of fillings. Take some home to show off your new-found skill. Savory snack included in the class. This is a 3-hour hands-on class with sampling and take-home recipes. No pastry is as versatile and easy to master as Pate a Choux, or choux paste. This classic French dough is the key to delicious eclairs, cream puffs, profiteroles, and gougeres, and it comes together with simple ingredients, a practiced technique, and no specialty equipment. In this 2.5 hour program, you'll practice a range of applications for this versatile dough and learn why it’s the perfect go-to for appetizers and desserts at your next gathering! You'll enjoy a buffet of your creations (the Roman gnocchi is a savory dish) in this hands-on class and take home recipes. Please wear closed-toe shoes. Join us for this demonstration class featuring... the delicious avocado! Learn about the history of the avocado while you enjoy some unexpected but totally awesome dishes-smoked avocado guacamole, bacon and avocado egg rolls, and dark chocolate avocado truffles. Fully narrated session includes generous tastings, tons of tips and techniques plus take-home recipes. (1.5 hours). Class fee is for one mom and one child. You may purchase one additional seat for a child through the store ($35/child age 7-14). Please specify child's age and name with your registration (in "comments" section). You'll be working with colorant, so wear appropriate clothing. It's Cinco de Mayo--time for an authentic Mexican fiesta! You'll prepare an approachable, fun, fresh menu that you'll easily use in your own home cooking time and time again. It's time to spice things up, so grab your friends and let's cook. Cerveza and sangria included. Lightweight pastas with fresh, flavorful sauces are welcome this time of year. Starting with homemade pasta, you'll make fettucine with asparagus pesto, roasted cherry tomatoes and parmesan as well as angel hair pasta with shrimp in a lemon cream sauce. Enjoy your hands-on meal with a chef-prepared salad and lemon panna cotta. Please wear closed toe shoes. This 2+hour program includes hands-on culinary instruction, a full meal, lots of tips and techniques and a take-home recipe booklet. Participate in an annual tradition at Pans on Fire: Celebrate mom this Mother's Day with a cooking class brunch. Prepare then dine on hashbrown-crusted asparagus quiche, breakfast fruit pizza, cardamom spiced bacon (this will make you positively swoon! ), and lemon-buttermilk scones with fresh lemon curd. Enjoy it all with a cup of coffee or a mimosa (orange juice for the young-un's). Kids 8 and up welcome. Please call the store to register them at the special price of $30 (ages 8-14). Limit 2 children per adult. Kindly register as soon as possible to help us with planning and coordination of this class. No same-day registrations will be accommodated. We recommend you enjoy a nice lunch before this class, which is hands-on and runs about 2 1/2 to 3 hours. Please note that this is not a nut-free class. Closed toe shoes required. You will be able to enjoy a lovely buffet of your creations and take home a recipe booklet. THIS IS OUR LAST AFTER-SCHOOL PROGRAM BEFORE SUMMER CAMP! New skills, fresh and seasonal food, kitchen safety and nutrition are the focus of our after school program. Each week we will focus on something new, preparing and eating delicious treats and bringing home the recipes and skills to cook at home. Cooking is a vital life skill. It's also a great way to learn more about math, science, history and nutrition. And of course it's fun and delicious as well. Our after school club is open to all students in 4th to 8th grades. Classes run 75 minutes, from 4 to 5:15 on Wednesdays. Sensory skills – Through tasting, hearing, touching, smelling and seeing, children will be exposed to and identify different foods. Motor skills – Active involvement with food will help large and fine motor skills. As well, food preparation enhances eye-hand coordination. Mathematics – Kids count, measure and follow recipe directions in the food-related activities. Safety – During food preparation you can teach children the importance of safety when dealing with food, utensils and appliances. Social skills – Working with other children will give the kids a sense of sharing and cooperation and an understanding of how to interact with others in groups. They will be able to learn from one another. All good cooks should know how to prepare a delicious souffle. In this 3-hour class, you'll make an outstanding cheese souffle (enjoy it with chilled tomato soup), a green chili and cheese souffle (with a green salad and a classic French vinaigrette), and individual chocolate souffles with creme anglaise. Ooh la la! This is a hands-on class, about 3 hours in length, which includes lots of tips and techniques, a full meal, and take-home recipes. Please wear closed toe shoes. Feel free to bring a bottle of wine to enjoy with your dinner. Tired of the same ol' side dishes for ribs, burgers and steak on the BBQ? Let's see if this class will inspire you this coming summer. Your instructor will make 3 or 4 side dishes (together they'll make a meal!) and discuss tips and techniques to make your outdoor meals super delicious. Memorial Day weekend traditionally kicks off ice cream season in the U.S., even though it's a staple year-round here in California. Today's flash class will show you some great ways to make, top, serve and decorate ice cream specialties. In this 90-minute demonstration class, we'll make sauces (hot fudge, marshmallow creme, and caramel), cone/cups, and even a blender ice cream. Generous tastings and take-home recipes included. The foundation of baking starts with precise measuring and an understanding of techniques. What better way to understand baking than to start at the very beginning, by grinding flour? Yup, when we say a loaf of bread was made from scratch we mean it! This class will start with learning about measuring both by volume and weight, understanding the difference between leavening agents, and grinding our own flour. We’ll work our way through pies, muffins, cakes, rolls, and breads. Every day includes both savory and sweet baking. The highlight of the week is when students present a delicious last-day-of-camp meal to their own guests. THIS IS A FOUR-SESSION PROGRAM for children starting Grade 2 through the end of Grade 5. Monday-Wednesday, 10:00 am-1:00 pm, Thursday 10:00 until 1:30 pm. Combine with Cookie Explosion for a week-long experience. SPECIAL CANCELLATION POLICY: SUMMER CAMP REGISTRATIONS ARE NON-REFUNDABLE. WITH A MINIMUM OF 2 WEEKS' NOTICE, A STUDENT MAY TRANSFER TO ANOTHER AVAILABLE 2019 SUMMER CAMP. THIS IS A FOUR-SESSION PROGRAM for children starting Grade 6 through high school. Monday-Wednesday, 2:30 to 5:30 pm, Thursday 2:30 until 6 pm. Combine with Cookie Explosion for a week-long experience. Working in small groups, your junior chef will be filling the kitchen full of trays and trays of cookies fresh from the oven—and all from scratch. A light snack will be provided to balance out all the sugary goodness. This is a ONE-SESSION hands-on baking class (10 am to 1 pm). Combine with Junior Chef Camp: Baking 101 for a week-long experience. This class is for children entering Grade 2 through the end of Grade 5. Working in small groups, your teen chef will be filling the kitchen full of trays and trays of cookies fresh from the oven—and all from scratch. A light snack will be provided to balance out all the sugary goodness. This is a ONE-SESSION hands-on baking class (2:30 to 5:30 pm). Combine with Teen Chef Camp: Baking 101 for a week-long experience. This class is for children entering Grade 6 through high school. Mama mia! We're traveling to Italy this week, at least in spirit, as we create traditional Italian cuisine. We'll learn how to make pasta, of course, and transform it into different shapes. We'll explore different regions of the country and learn about the foods that make them all special. Lunch and a snack are made each day. Led by a talented culinary instructor, your young chef will practice hands-on cooking skills every day. The highlight of the week is when students present a delicious last-day-of-camp meal to their own guests. THIS IS A FOUR-SESSION PROGRAM for children starting Grade 2 through the end of Grade 5. Monday-Wednesday, 10:00 am-1:00 pm, Thursday 10:00 until 1:30 pm. Combine with Little Italy for a week-long experience. THIS IS A FOUR-SESSION PROGRAM for children starting Grade 6 through high school. Monday-Wednesday, 2:30 to 5:30 pm, Thursday 2:30 until 6 pm. Combine with Little Italy for a week-long experience. San Francisco's Little Italy was settled just after the 1906 earthquake. Other Little Italys are far older. While they are a great place to find traditional Italian cooking, many recipes brought over with families coming to find a new home were changed and adapted. What we know as pizza, or spaghetti and meatballs, are far from their original recipes. We're going to be making some Americanized versions of Italian food. Class includes a snack and a meal. This is a ONE-SESSION hands-on cooking program (10 am to 1 pm). Combine with Junior Chef Camp: Cooking Through Italy for a week-long experience. This class is for children entering Grade 2 through the end of Grade 5. San Francisco's Little Italy was settled just after the 1906 earthquake. Other Little Italys are far older. While they are a great place to find traditional Italian cooking, many recipes brought over with families coming to find a new home were changed and adapted. What we know as pizza, or spaghetti and meatballs, is far from the original recipe. We're going to be making some Americanized versions of Italian food. Class includes a snack and a meal. 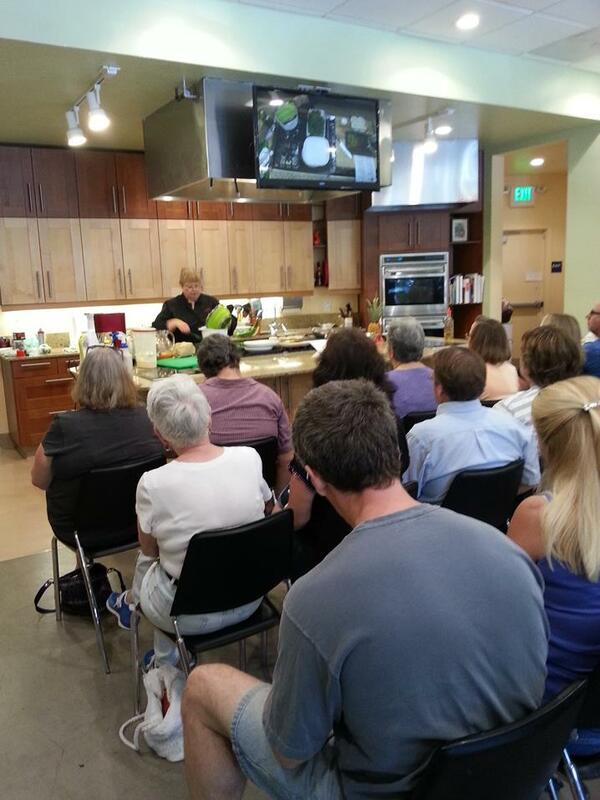 This is a ONE-SESSION hands-on cooking program (2:30 to 5:30 pm). Combine with Teen Chef Camp: Cooking Through Italy for a week-long experience. This class is for children entering Grade 6 through high school. A bell sounds as you walk through the door of the bakery and there before you is a collection of wonderful treats. The cookies bigger than your hand, the brightly colored macarons, the donuts dripping with glaze and the layered cake already cut into slices waiting to be served. Our bakeshop camp focuses on the delights of the bakery, from the savory quiche to the the fluff of a perfect meringue. Campers will learn to roll out pie crust, pipe frosting, play with flavor combinations and bake up a storm. THIS IS A FOUR-SESSION PROGRAM for children starting Grade 2 through the end of Grade 5. Monday-Wednesday, 10:00 am-1:00 pm, Thursday 10:00 until 1:30 pm. Combine with Cupcake Wars for a week-long experience. A bell sounds as you walk through the door of the bakery and there before you is a collection of wonderful treats. The cookies bigger than your hand, the bright colored macarons, the donuts dripping with glaze and the layered cake already cut into slices waiting to be served. Our bakeshop camp focuses on the delights of the bakery, from the savory quiche to the the fluff of a perfect meringue. 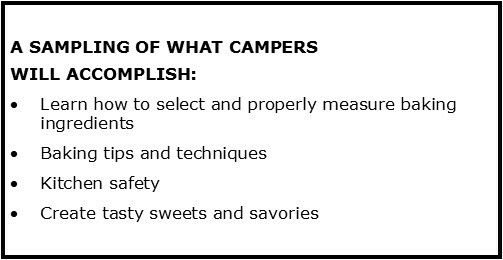 Campers will learn to roll out pie crust, pipe frosting, play with flavor combinations and bake up a storm. THIS IS A FOUR-SESSION PROGRAM for children starting Grade 6 through high school. Monday-Wednesday, 2:30 to 5:30 pm, Thursday 2:30 until 6 pm. Combine with Cupcake Wars for a week-long experience. It's time to unleash your creativity and design the perfect cupcake! We'll learn the basics of baking cupcakes and making frostings, discuss techniques and flavor combinations, then break into teams to create some never been tasted treats! Each team will design a cupcake batter, frosting, and decoration scheme. A light meal is included. This is a ONE-SESSION hands-on baking program (10 am to 1 pm). Combine with Junior Chef Camp: Bakeshop for a week-long experience. This class is for children entering Grade 2 through the end of Grade 5. This is a ONE-SESSION hands-on baking program (2:30 to 5:30 pm). Combine with Teen Chef Camp: Bakeshop for a week-long experience. This class is for children entering Grade 6 through high school. A quintessential part of taking a road trip is the food you eat along the way. The world’s best pie, the place everyone lines up for pizza, that diner you heard about on that TV show. Food can tell us a story about where we are, and can remind us of where we’ve been. We’re spending a week exploring the foods that define the country, from the pizza in New York to chicken long rice in Hawaii. THIS IS A FOUR-SESSION PROGRAM for children starting Grade 2 through the end of Grade 5. Monday-Wednesday, 10:00 am-1:00 pm, Thursday 10:00 until 1:30 pm. Combine with Disneyland for a week-long experience. THIS IS A FOUR-SESSION PROGRAM for children starting Grade 6 through high school. Monday-Wednesday, 2:30 to 5:30 pm, Thursday 2:30 until 6 pm. Combine with Disneyland for a week-long experience. Disneyland is a park populated not just by rides and characters, but with a wide variety of restaurants, shops, and food carts. We’ll recreate some park favorites, both sweet and savory. This is a ONE-SESSION hands-on cooking program (10 am to 1 pm). Combine with Junior Chef Camp: American Road Trip for a week-long experience. This class is for children entering Grade 2 through the end of Grade 5. Disneyland is a park populated not just by rides and characters, but a wide variety of restaurants, shops, and food carts. We’ll recreate some park favorites, both sweet and savory. This is a ONE-SESSION hands-on cooking program (2:30 to 5:30 pm). Combine with Teen Chef Camp: American Road Trip for a week-long experience. This class is for children entering Grade 6 through high school. Were you ever told not to play with your food? That’s never the case at Pans on Fire and certainly not when it comes to pasta. We’ll be making our own dough, playing with adding colors, and learning how to shape, stuff, and cook. This is a THREE-SESSION hands-on cooking camp (10 am to 1 pm) for children entering Grade 2 through the end of Grade 5. This is a THREE-SESSION hands-on cooking camp (2:30 to 5:30 pm) for children entering 6th grade up through 12th grade. We can’t tell you what mystery foods you’ll find in your basket, but it’s Independence week and there might be a few 4th of July themed surprises. We’ll work on a recipe as a class to gain familiarity with the kitchen, then students will break into teams to make an entree and an appetizer or dessert using 6 mystery ingredients. This is a ONE-SESSION hands-on program (10 am to 1 pm). This class is for children entering Grade 2 through the end of Grade 5. This is a ONE-SESSION hands-on program (2:30-5:30 pm). This class is for children entering Grade 6 through the end of Grade 12. We're taking a journey though the bakeshops and kitchens of Europe to find the best warm, doughy, sweet, delicate, and decadent baked goods. We'll explore from Sweden to Italy, from Portugal to Austria, and everywhere in between. We'll explore breakfast, lunch, snacks and desserts, and on Thursday we'll make a meal to serve to guests. THIS IS A FOUR-SESSION PROGRAM for children starting Grade 2 through the end of Grade 5. Monday-Wednesday, 10:00 am-1:00 pm, Thursday 10:00 until 1:30 pm. Combine with Quick Breads for a week-long experience. THIS IS A FOUR-SESSION PROGRAM for children starting Grade 6 through high school. Monday-Wednesday, 2:30 to 5:30 pm, Thursday 2:30 until 6 pm. Combine with Quick Breads for a week-long experience. One of the great things about quick bread is that they are, as the name implies, quick to make. There's no waiting for bread to rise, just a quick trip to the oven, some as little as ten or twelve minutes. We'll explore the sweet and savory, from cheesy biscuits to chocolate zucchini bread to baking powder cinnamon rolls. Since man can't live by bread alone we'll make a chili to go along with the breads. This is a ONE-SESSION hands-on baking camp (10 am to 1 pm). Combine with Junior Chef Camp: European Baking for a week-long experience. This class is for children entering Grade 2 through the end of Grade 5. This is a ONE-SESSION hands-on baking camp (2:30 to 5:30 pm). Combine with Teen Chef Camp: European Baking for a week-long experience. This class is for children entering Grade 6 through high school. THIS IS A FOUR-SESSION PROGRAM for children starting Grade 2 through the end of Grade 5. Monday-Wednesday, 10:00 am-1:00 pm, Thursday 10:00 until 1:30 pm. Combine with Cookies From Around the World for a week-long experience. This week we're taking some notes from a few of our favorite Food Network Stars. We'll be grilling Bobby Flay-style, learning about Jeff Mauro's amazing sandwiches, heading to the ranch with some of Ree Drummond's favorite recipes and keeping things fresh with inspiration from Ina Garten. Lunch and a snack are made each day. Led by a talented culinary instructor, your young chef will practice hands-on cooking skills every day. The highlight of the week is when students present a delicious last-day-of-camp meal to their own guests. THIS IS A FOUR-SESSION PROGRAM for children starting Grade 6 through high school. Monday-Wednesday, 2:30 to 5:30 pm, Thursday 2:30 until 6 pm. Combine with Cookies From Around the World for a week-long experience. The chocolate chip cookie was invented in America, but cookies are found in many cultures around the world. Working in small groups, your junior chef will be filling the kitchen full of trays and trays of cookies fresh from the oven—and all from scratch. We'll learn about the sweet treats from Italy, China (not furtune cookies, those are from San Francisco) England and other countries. A light snack will be provided to balance out all the sugary goodness. This is a ONE-SESSION hands-on baking camp (10 am to 1 pm). Combine with Junior Chef Camp: Hogwarts for a week-long experience. This class is for children entering Grade 2 through the end of Grade 5. The chocolate chip cookie was invented in America, but cookies are found in many cultures around the world. Working in small groups, your teen chef will be filling the kitchen full of trays and trays of cookies fresh from the oven—and all from scratch. We'll learn about the sweet treats from Italy, China (not fortune cookies, those are from San Francisco), England and other countries. A light snack will be provided to balance out all the sugary goodness. This is a ONE-SESSION hands-on baking camp (2:30 to 5:30 pm). Combine with Teen Chef Camp: Food Network Stars for a week-long experience. This class is for children entering Grade 6 through high school. Everything has to start somewhere, and this week we're taking food all the way to the beginning (or at least as far back as we can without finding a cow to milk.) We're making butter from cream, jam from fruit, grinding our own flour and making our own cheese. It's a wonderful chance to see how food is made. We'll even make s'mores from homemade marshmallows and graham crackers. THIS IS A FOUR-SESSION PROGRAM for children starting Grade 2 through the end of Grade 5. Monday-Wednesday, 10:00 am-1:00 pm, Thursday 10:00 until 1:30 pm. Combine with Copycat Recipes for a week-long experience. THIS IS A FOUR-SESSION PROGRAM for children starting Grade 6 through high school. Monday-Wednesday, 2:30 to 5:30 pm, Thursday 2:30 until 6 pm. Combine with Copycat Recipes for a week-long experience. Have you ever craved a Girl Scout cookie in the off season? Do you love Cheeze-It crackers? Have you ever wanted to know how to make a Wendy's Frostie? We'll spend the day recreating some of our favorite snack foods. This is a ONE-SESSION hands-on cooking program (10 am to 1 pm). 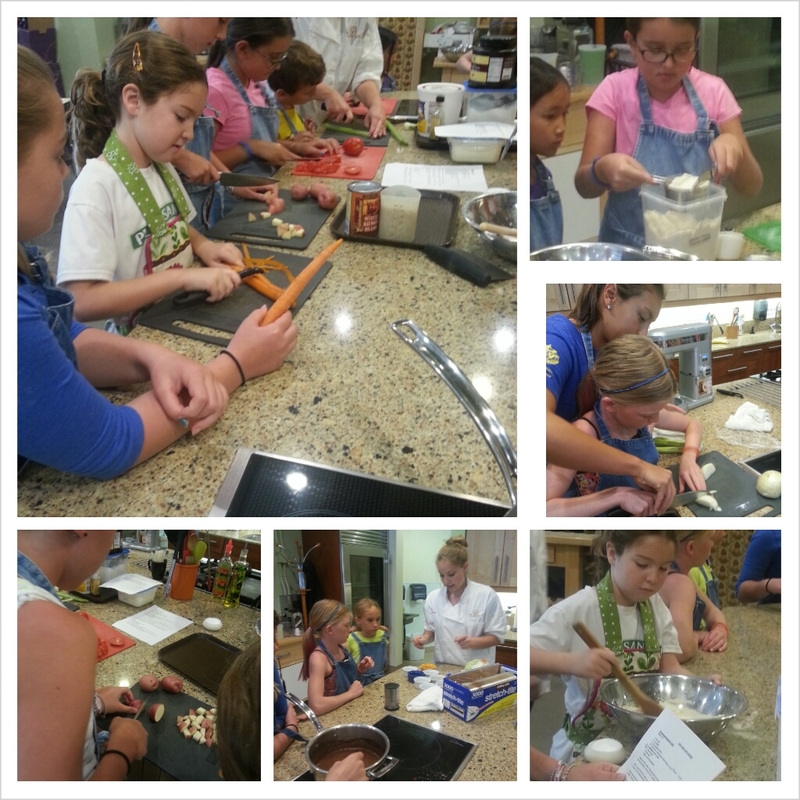 Combine with Junior Chef Camp: Make it From Scratch for a week-long experience. This class is for children entering Grade 2 through the end of Grade 5. 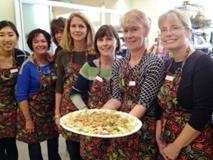 This is a ONE-SESSION hands-on cooking program (2:30 to 5:30 pm). 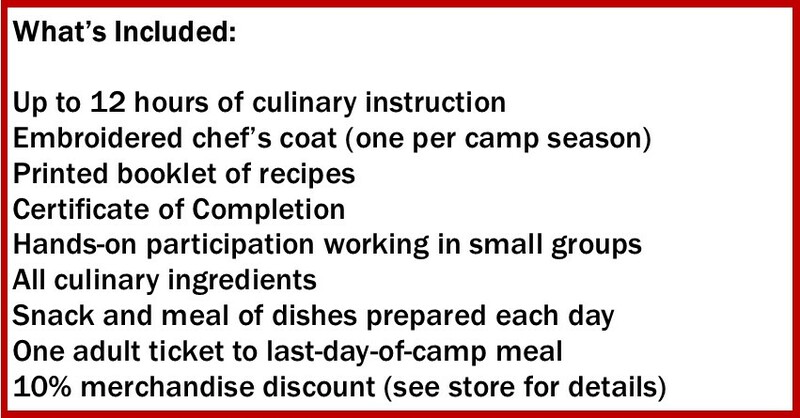 Combine with Teen Chef Camp: Make it From Scratch for a week-long experience. This class is for children entering Grade 6 through high school. Ooh la la! French cooking is as varied as its landscape, from the Le Hachis Parmentier served on the glittering streets of Paris to the chicken provencal made in the kitchens of quiet country homes. It’s also the home of many cooking techniques, from the roux used to make sauces and soups to the choux pastry used for eclairs and gougeres. This week we’ll explore the traditional and regional foods of France, including a few desserts, of course. THIS IS A FOUR-SESSION PROGRAM for children starting Grade 6 through the end of Grade 12. Monday-Wednesday, 10:00 am-1:00 pm, Thursday 10:00 until 1:30 pm. Combine with Chocolate for a week-long experience. Are you in love with the Great British Bake Off? Do you love to play with butter, flour, and sugar? Do you love to express your creativity? We won't be baking in a tent (and sorry, no Paul Hollywood either) but for five days we'll be creating our own baking experience. No knowledge of the British Bake Off is necessary. No fancy skill level required. Class will be broken into three parts. A grounding in the basics. We'll discuss how to measure, cream butter and sugar, make choux pastry, play with flavors, and more. We'll explore the differences between types of meringues and buttercreams. We'll learn how to alter recipes. The challenges. Like the GBB we'll have a signature bake and a technical challenge. Working in a team you'll take what you know and add creativity to creat delicious and fun treats. The Showstopper. As a class we'll work on a grand project. The class will focus primarily on sweet treats, but there will be a savory dish every day. It's recommended that students have taken at least one cooking class with us. While students are not expected to have learned any specific techniques, a general understanding of baking and kitchen equipment will help. The theme is based on The Great British Baking Show but no knowledge of the series is necessary for this camp. THIS IS A FIVE-SESSION PROGRAM for children ages 12 and up. Monday-Thursday, 2:30 pm-6:30 pm, Friday 2:30 until 7 pm. Kids ages 10 and 11 are allowed with chef approval (call the store at 925-600-7267 and arrange a call/meeting with Chef Sarah). Chocolate has been a favorite ingredient for more then 4,000 years. While we often think for of desserts, there are both sweet and savory dishes. We'll be making some of our favorite chocolate recipes, from a chocolate chili to chocolate brownies with a meringue frosting and chocolate eclaires. This is a ONE-SESSION hands-on cooking program (10 am to 1 pm). Combine with Teen Chef Camp: Travels Through France for a week-long experience. This class is for children entering Grade 6 through high school. We're cooking and baking our way through Scandinavia today, enjoying foods found in Norway, Sweden and Denmark. This is a ONE-SESSION hands-on cooking class (10 am to 1 pm) for children entering Grade 2 through the end of Grade 5. This is a ONE-SESSION hands-on cooking class (2:30 to 5:30 pm) for children entering Grade 6 through high school. We're cooking and baking our way through the green isle of Ireland today, enjoying delicious traditional foods. We're cooking and baking our way through Germany and Switzerland, enjoying delicious traditional foods. This is a ONE-SESSION hands-on cooking program (10 am to 1 pm) for children entering Grade 2 through the end of Grade 5. We're cooking and baking our way through Germany and Switzerland today, enjoying delicious traditional foods. We're cooking and baking our way through Poland, Hungary, and the Czech Republic to create delicious traditional foods. We're cooking and baking our way through Greece, enjoying delicious traditional foods influenced by centuries of Mediterranean trade and migration.